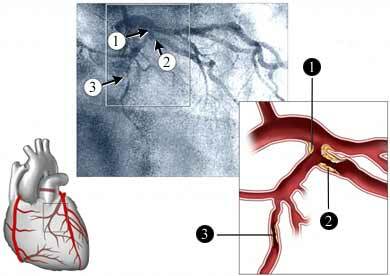 An angiography is an x-ray exam of the blood vessels. The exam uses a chemical that is injected into the blood vessels. The chemical makes the blood vessels easier to see on the x-ray. In some cases, a blocked blood vessel can be treated during the procedure. This would prevent the need for another procedure. You will need to arrange for a ride to and from the procedure. A local anesthesia will be injected into your arm or groin. A small dose of sedative may also be given by IV. An area of your groin or arm will be cleaned. This is where a catheter will be inserted. A small incision will be made into your skin. The catheter will be placed through the incision into an artery. The catheter will be guided through the arteries to the area to be examined. The contrast material is injected through the catheter. The procedure will be viewed on a nearby monitor. Several sets of x-rays will be taken. The catheter will then be removed. Pressure will be applied to the area for about 10 minutes. Less than an hour to several hours. It depends on whether the doctor decides to fix any problems at the same time. You will need to lie flat for a period of time. The length of time depends on your overall health and the reason for the exam. Tell the nurse if you notice any swelling, bleeding, black and blue marks, or pain where the catheter was inserted. You may be allowed to leave the hospital after this recovery period. The length of your stay will depend on your other medical problems. When you return home after the procedure, be sure to follow your doctor's instructions. The doctor will examine the x-rays. Your doctor will discuss the findings and any necessary treatment options with you. Catheter angiography. Radiology Info—Radiological Society of North America website. Available at: https://www.radiologyinfo.org/en/info.cfm?pg=angiocath. Updated January 20, 2018. Accessed March 1, 2018. Coronary angiography. National Heart, Lung, and Blood Institute website. Available at: https://www.nhlbi.nih.gov/health-topics/coronary-angiography. Accessed March 1, 2018.